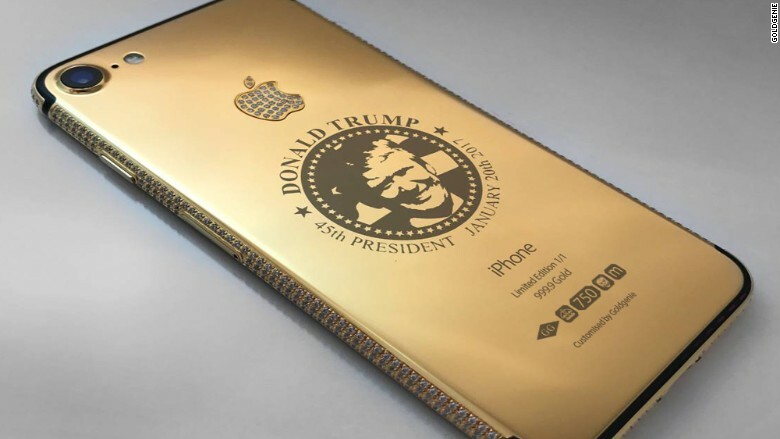 This year, one option is an iPhone 7 encased in solid gold, encrusted with diamonds and bearing the face of Donald Trump. Priced around $151,000, it's just one example of the mind-blowing bling sold by Goldgenie, a store in the United Arab Emirates where the super rich do their shopping. "There are very wealthy, high-net-worth individuals all over the world and sometimes its very difficult to buy gifts for them because they have everything," said Frank Fernando, Goldgenie's managing director. All the opulent objects on sale at his store in Sharjah, a city near Dubai, are either solid gold, gold plated or diamond encrusted. But the idea for the golden Trump iPhone came from a customer only recently. A Chinese woman walked into the store last month and requested that Goldgenie put together the glitzy device emblazoned with the president-elect's features, Fernando said, declining to identify the woman by name. He said he believes her family wants to give it to the U.S. president-elect after his inauguration next month. If they do, the phone would fit well with the famously golden decor at Trump's penthouse apartment in New York City. Since selling that first Trump iPhone, Goldgenie has received a further nine orders for gold-plated ones bearing his face. The billionaire president-elect is proving to be good business for the store, which opened earlier this year. But the phones are far from the most expensive item on sale. 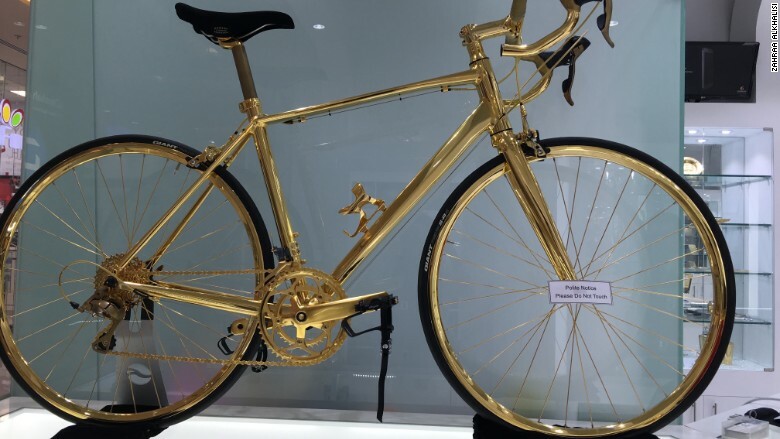 A gold-plated racing bike will set you back about $350,000. Goldgenie started out in London back in 1989. The company's business concept was simple: gold plate virtually any item its customers wanted. Fernando says his staff members will even take their special gold-plating machine to wealthy individuals' homes in order to cover their entire bathrooms in the precious metal. The company picked the UAE as the place to open its first retail store because of the strong demand from the Gulf region. "We have many visits from the royal families," Fernando said. "They visit us in London and they don't just buy one phone. They buy five, ten phones to give as gifts. We needed to come here to show ourselves to all the people in the Arab states." Goldgenie isn't satisfied with just the one retail outlet, though. The brand is opening a store in neighboring Qatar early next year and is in discussions to set up another in Saudi Arabia, Fernando said. 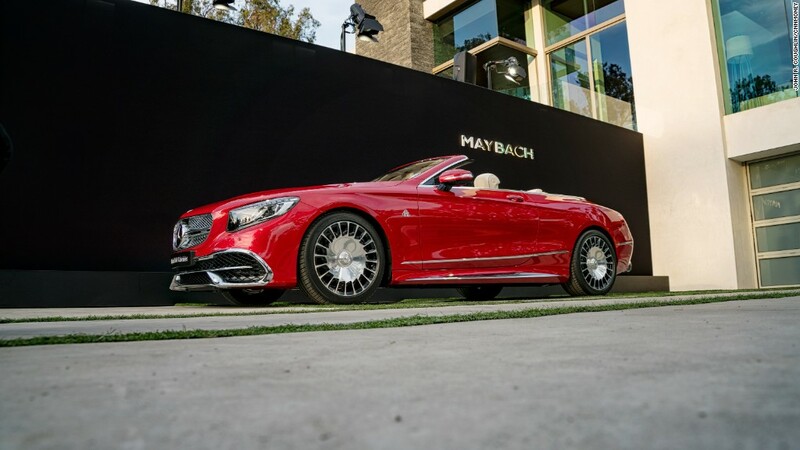 And it's aiming to take its ostentatious offerings farther afield with plans for stores in Malaysia and Spain.